You well and truly know the drill by now: it’s the welcome return to disc for another bunch of wild and wacky assorted Looney Tunes cartoons, now in pin-sharp high-def! With much less fanfare and packaging options, Warner Home Video open up the vaults for another dive into vintage cartoon territory that, thankfully and finally shines the light away from Chuck Jones and onto some of his just as worthy and esteemed Termite Terrace colleagues. 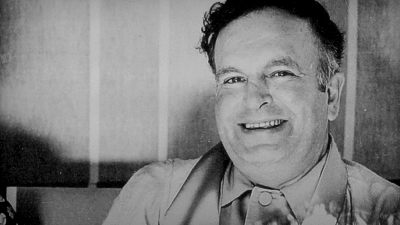 One hundred years after his birth, and especially since his passing ten years ago in February 2002, the Jones legend has grown largely through Warner Bros.’ prolific showcasing of his directorial outings via countless documentary tributes and home video cartoon collections. Indeed, going by Warners’ leaning on Jones’ library and unless you didn’t know any better, anyone would think Chuck was the sole artist responsible for the majority of the Studio’s Looney Tunes cartoons. To casual movie viewers it’s perfectly understandable: when Chuck and his one-time colleague Friz Freleng were among the last of original producer Leon Schlesinger’s golden age gang still creating new animation in the 1970s and 80s, they were largely the only ones keeping those flames alive. 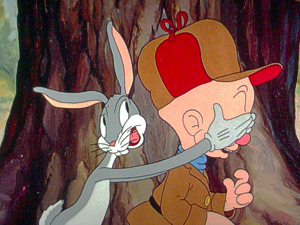 Following fellow-director Bob Clampett’s re-ignition of interest in the Looney Tunes characters in the 1970s (with the concurrently released Bugs Bunny Superstar from the Warner Archive), a gentle rivalry between Jones and Freleng saw the two battle it out for “ownership” of the characters’ roots, with Freleng perhaps clawing back a lion’s share of the credit in The Looney, Looney, Looney Bugs Bunny Movie and Jones offering a more pragmatic view in his Bugs Bunny/Road Runner Movie. 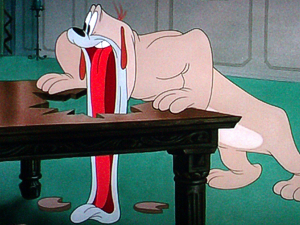 With the death of Clampett, Tex Avery and Freleng, Jones became pretty much the sole survivor of those Termite Terrace days and, quite rightly, became the de-facto go-to-guy for all things Looney Tunes, with home video and especially the deluxe LaserDisc collections of the 1990s bringing new appreciation to their many animated shorts and the internet a chance for fans to exchange views and really get together to study and rediscover them all over again. Largely because Chuck was the only one left to pass on his knowledge, the onus perhaps began to swing a little too much the other way: dedicated collections of his later Tom & Jerry cartoons, an eventual Archive issue for The Phantom Tollbooth and several and much-regurgitated tribute films were all very welcome, but further clouded the contributions his stable-mates had made. 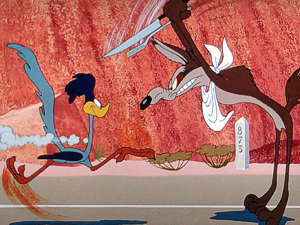 Clampett, Avery, Freleng, Frank Tashlin, and especially the much underrated Bob McKimson – they may not have all been Chuck Jones, but they are as just much of the Warner cartoon story and all produced their own (many) moments of brilliance. The inaugural Looney Tunes Platinum Collection last year, while frustrating to those wanting to learn a little more of these other names, pretty much got Chuck out of its system in one hit: in the centenary year of his birth, one can understand the heavy leaning on his output (also meaning many of the best cartoons in the series made their HD debut earlier than they would have done) and the focus on Jones for the supplemental material, but in many ways that now means the landscape is clear to now shift the onus onto others. Another highlight of the first edition was a unique gathering of complete character appearances for several characters, from the Tazmanian Devil to Marvin The Martian, and one gets the distinct impression that the stand-alone release earlier this year of Jones’ Sniffles and Hubie & Bertie cartoons was a way to offer another couple of character assemblages without taking up any vital Platinum Collection real estate. 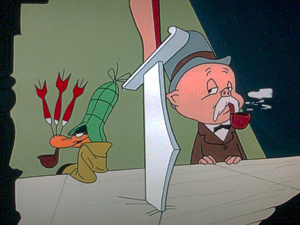 Jones is still present in the credits of the cartoons that make up the bulk of this second helping of classic Looney Tunes, of course, but this time there is more room for his associates, primarily in this case the legendary Avery – even taking in some of his later MGM work – and Freleng, who arguably did his best to keep the series running even when the Studio had closed down. As always, a disclaimer is in place to acknowledge the potential racial stereotyping that can sometimes pop up during a viewing of these shorts, which also means that the cartoons are presented complete and uncut in the manner serious collectors expect. 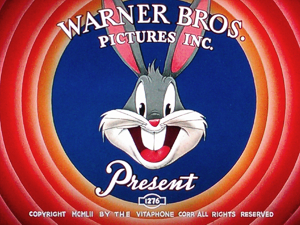 The later television distribution of the Warners shorts meant the chopping and changing of many of the original cartoons’ title cards, especially a large selection of pre-1948 shorts that were sold to Associated Artists Productions who subsequently allowed them to fall into the public domain. Here, Warners has not only reclaimed ownership of these cartoons, reuniting them with the rest of the library, but has restored the original title cards where possible, a nice touch that allows a look at some great indicative artwork. 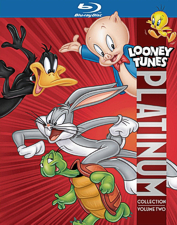 Like before, the Looney Tunes Platinum Collection Volume 2 does not simply sit as an HD upgrade of its Golden Collection counterpart: to all intents and purposes these releases have proven to be “new” groupings of cartoons pulled from across the entire Golden range. I think this makes for a more interesting selection and enticement to go back to the well: if these were simple repeats many could be left wondering what the point was, whereas the drawing of material from across that series’ six volumes provides some of the very best shorts that we originally had to wait until later releases for, as well as some of the more rare and obscure titles that were saved for the later, more aficionado-friendly sets. Disc One features lots of Bugs and Daffy to start with: A Wild Hare, Buckaroo Bugs, Buccaneer Bunny, Ali Baba Bunny, Show Biz Bugs, The Wise Quacking Duck, the almost forgotten Arthur Davis’ What Makes Daffy Duck?, Book Revue (Clampett nicely spoofing the kind of Sniffles cartoon Jones was making around the time); Porky/Daffy in Deduce, You Say, Clampett’s legendary Porky In Wackyland, the absolutely charming live-action/animation combo You Ought To Be In Pictures, Porky In Egypt; a Sylvester/Tweety mix of Back Alley Oproar, Little Red Rodent Hood, Canned Feud, Gift Wrapped, Birdy And The Beast, Home Tweet Home; and an assortment of Wile E Coyote, Road Runner, Foghorn Leghorn, Pepe Le Pew and Speedy offerings: Going! Going! Gosh!, Zipping Along, Scent-Imental Romeo, The Foghorn Leghorn, The High And The Flighty, Tabasco Road and Mexicali Schmoes. Disc Two rounds out the primary Looney Tunes selection with Wabbit Twouble, Jones’ “Hunting Trilogy” of Rabbit Fire, Rabbit Seasoning and Duck! Rabbit, Duck! ; the Complete Nasty Canasta: Drip-Along Daffy, My Little Duckaroo, Barbary-Coast Bunny; a trio of Bugs Bunny Vs. Cecil Turtle shorts with Tortoise Beats Hare, Tortoise Wins By A Hare, Rabbit Transit; a pre-Bugs collection of Early Wabbits: Porky’s Hare Hunt, Hare-Um Scare-Um, Prest-O Change-O, Elmer’s Candid Camera; the Complete Beaky Buzzard of Bugs Bunny Gets The Boid, The Bashful Buzzard, The Lion’s Busy, Strife With Father; An Itch In Time and A Horsefly Fleas making up the Complete A. Flea appearances, plus a slew of One-Shot Classics: Hollywood Steps Out, Page Miss Glory, Rocket-Bye Baby, Russian Rhapsody and Dough Ray Me-Ow. As you can see, it’s a veritable potpourri of Looney Tunes classics, all assembled with care and attention to their restorations, content selection and extremely generous selection of bonus features – an entire third disc of ’em! The set is immediately recommended just on the basis of what that third disc contains itself, but we must also not forget that the point of this set is ostensibly the 50 shorts spread across those first two discs to begin with! You’ll know if there are titles here that tickle your funny bone, with everything from Avery’s first “official” Bugs Bunny cartoon to the midst of Freleng’s last hurrahs with Speedy Gonzales. Golden volumes one, two and five seem to be where most of the pickings come from, but there are a fair few new-to-disc shorts that I don’t believe I’ve seen released before, and certainly not in HD transfers as sharp as these. In a word…yes. 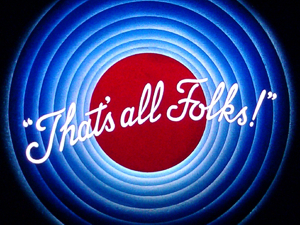 Despite the amount of great offerings from the Looney Tunes stable to be found on the first two discs, it’s in Disc Three’s extensive supplemental selection that real fans will find themselves most jubilant, especially with the debut of a brand new HD documentary on Avery and (finally!) the disc debut of a vintage and altogether excellent previous documentary on the great man. Before we get there, there’s another healthy selection of material from the previous Golden Collections to wade through: yes, some may complain that they already have much of this material on disc already but to be honest I haven’t seen some of that stuff in years and I sometimes find it’s great to rediscover it in these new collections. Besides, given that these are to an extent upgrades for the same cartoons, I think more would complain if the same extras were not carried over, so really this is the best of both worlds, and a real boon to those coming to these cartoons for the first time on any kind of disc format. And the choice is stunning: for a start, out of the 50 cartoons across the first two discs, no less than 37 of them feature Audio Commentaries! 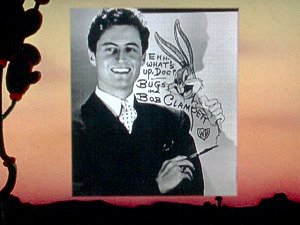 For the record (take a deep breath), Disc One includes A Wild Hare with Looney Tunes director Greg Ford, who also speaks for Ali Baba Bunny, Show Biz Bugs, Back Alley Oproar, Scent-Imental Romeo and The High And The Flighty. Historian Michael Barrier (and original directors via archive) comments on Buckaroo Bugs, Long-Haired Hare, Book Revue, Porky In Wackyland and The Foghorn Leghorn, while director John Kricfalusi also remarks on Buckaroo Bugs with animators Eddie Fitzgerald and Kali Fontecchio. Deduce, You Say has documentary filmmaker Constantine Nasr, You Ought To Be In Pictures, Canned Feud, Tabasco Road and Mexicali Schmoes feature historian Jerry Beck, and animator Mark Kausler – always a terrific listen – pops up on Porky In Egypt and Birdy And The Beast. In addition there are Alternate Audio Programs (mostly music-only, some with sound effects) for Ali Baba Bunny, Scent-Imental Romeo, The High And The Flighty, Tabasco Road and Mexicali Schmoes. Also gracing this first disc are welcome reprisals for some of the excellent Behind The Tunes featurettes. 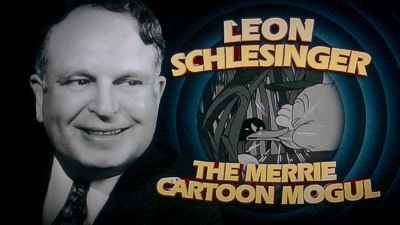 First up is the new in HD Leon Schlesinger: The Merrie Cartoon Mogul documentary, a twenty minute look at the Studio’s legendary but rarely profiled producer who was tough but made sure his directors had the maximum freedom they could in creating some of the funniest cartoons of all time. The Man From Wackyland: The Art Of Bob Clampett (21:10) pretty much does the same for one of Schlesinger’s original star directors, and one that did more than his fair share in shaping the wild and wacky Warners style, while Bosko, Buddy And The Best Of Black And White is a shorter look back, at just under ten minutes, at the earliest days of the Schlesinger studio. 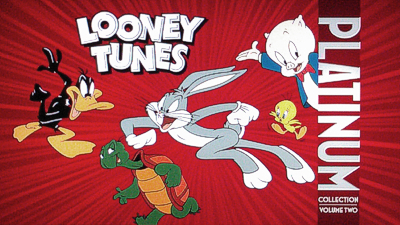 On Disc Two, the Audio Commentaries continue for the remaining cartoon selection of Wabbit Twouble, Rabbit Seasoning, Drip-Along Daffy, Tortoise Beats Hare and Bugs Bunny Gets The Boid with Barrier, plus another Tortoise Beats Hare track with Chuck Jones. Kausler speaks on Tortoise Wins By A Hare and Russian Rhapsody, Ford and Jones comment for Rabbit Fire, with Ford going solo for Hollywood Steps Out, Duck! Rabbit, Duck! 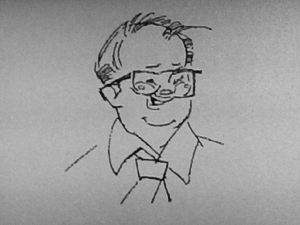 has Eric Goldberg, Paul Dini remarks on The Bashful Buzzard, there’s Kricfalusi and Bill Melendez on An Itch In Time, Page Miss Glory with Will Friedwald, Rocket-Bye Baby with Nasr, and Beck again for Porky’s Hare Hunt, Elmer’s Candid Camera and Dough Ray Me-Ow. Alternate Audio Programs are featured for Rabbit Fire, Rabbit Seasoning, Duck! 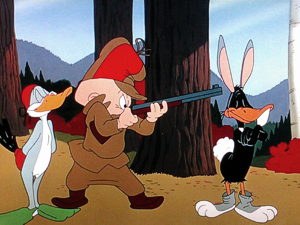 Rabbit, Duck!, Drip-Along Daffy and Barbary-Coast Bunny, while further Behind The Tunes explore Jones’ Hunting Trilogy in A Hunting We Will Go: Chuck Jones’ Wabbit Season Twilogy (9:30). Forever Befuddled (3:27) is a brief career retrospective for Elmer Fudd with Leonard Maltin, Noel Blanc and current vocalist Joe Alaskey, while Looney Tunes Goes Hollywood (9:20) highlights some of the cartoons’ many references and caricatures of then-Hollywoodland celebrities. 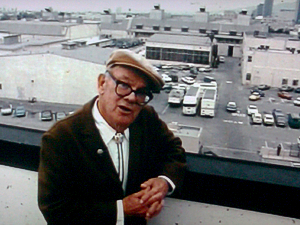 It’s great to see the seven minute Conversation With Tex Avery again, hearing directly from the man himself on the rooftop of the WB Studio, and the ten minute Looney Tunes Go To War! again places some of the vintage era cartoons in obvious context. As if all that weren’t already enough to get through – trust me, there’s a good couple of evenings’ worth there – I defy anybody to be less than impressed with the gathering of Blu-ray-exclusive supplements assembled for Disc Three. 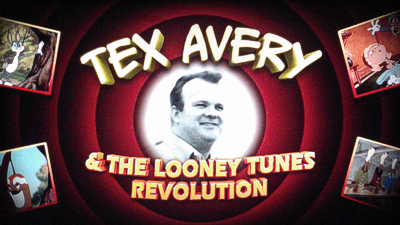 Chief of these is the new HD documentary King-Size Comedy: Tex Avery And The Looney Tunes Revolution (41:30), produced by Nasr and his new, always excellent Rivendell Films. Just as expected, this is a wonderfully in-depth and authoritative retrospective on Avery’s career, primarily centering on his time at Warners than his later run at MGM, where he directed what can only be described as some of the epitome examples of the classic studio animated short film. Taking full advantage of its generous running time, King-Size Comedy is a long overdue account of animation comedy’s one and only true master. Somewhat even better, for me at least, is the inclusion of the vintage documentary Tex Avery: King Of Cartoons (52 mins, and incorrectly stated as King Of Comedy on the menu when everyone knows that’s a Martin Scorsese picture). This BBC-produced documentary, originally airing on TBS in the United States, takes a more leisurely approach to looking at Tex’s work, this time most notably his MGM period. It’s the kind of thing that one would have expected to turn up on the old Compleat Tex Avery LaserDisc compendium of those cartoons, or perhaps on a DVD or Blu-ray updating of that set. Rumored for a loooooong while, I wanted to make sure Nasr was aware of it back when I attended the 2008 Comic-Con in San Diego, and he pleased me with his knowledge of the program. Without a dedicated Avery collection seemingly on the cards anytime soon, at least I can retire my well-worn off-air VHS taping and feel satisfied that others can at least see this great documentary for themselves. Coming from 1988, it’s typically slower than today’s soundbite and clip heavy edited exercises, but then it’s a more scholarly and serious appraisal of Avery’s work, even when debating the merits of giant canaries and wolf-whistle takes! In short, the inclusion of Tex Avery (later subtitled King Of Cartoons to tie in with Joe Adamson’s book of the same title), making its home video disc debut here, is well worth the price of the set in itself, in my humble opinion. Building on the kind of documentaries that saw fresh light shone on classic cartoons in the 1970s and 80s, due also in part to the homage of Who Framed Roger Rabbit, it remains a unique piece that celebrates one of the true masters of animation – see it! 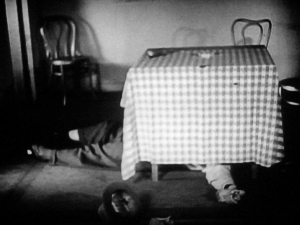 Illustrating the point, a collection of The Best Of The Rest Of Tex brings together almost an hour and a half of those terrific MGM shorts, covering a ten-year period between 1942 and 1952, beginning with his first, The Blitz Wolf. Ten more follow, including the immortal Red Hot Riding Hood, the debut of Screwball Squirrel, more wolf antics in Swift Shift Cinderella, the genre-defining King-Size Canary and Bad Luck Blackie, more appearances of another popular character in Señor Droopy and Wags To Riches, plus Symphony In Slang, the hair-in-the-gate fun of Magical Maestro and Rock-A-Bye Bear. All of them represent not only some of Avery’s finest timing and gags, but some of the purest and greatest cartoons, period. 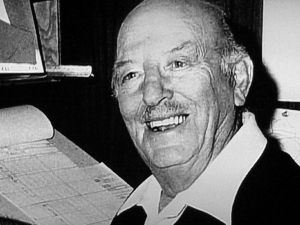 Also receiving acknowledgement this time out is Avery’s Schlesinger stable-mate Friz Freleng, who himself left the WB Studios to moonlight at competitors MGM for around one year in the late 1930s. A 2006 Friz On Film documentary profile sets things up with the excellent aspect of having Friz himself on hand via some of the last interviews he participated in and, relaxed and ready to entertain, he shares many anecdotes on working at Termite Terrace. Over around 55 minutes, Friz delves into the development of the various Looney Tunes characters, especially Porky Pig, but also touches on his later success with The Pink Panther, so it’s a pretty all-encompassing program. 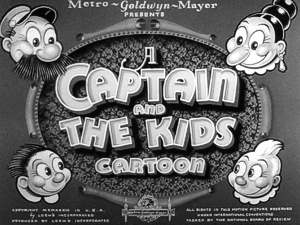 Again illustrating the point is a 45-minute selection of five Friz At MGM cartoons featuring his Captain And The Kids characters: Poultry Pirates, A Day At The Beach, The Captain’s Christmas, Seal Skinners and Mama’s New Hat. 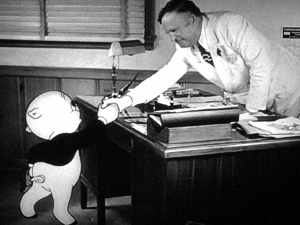 Looking back on the classic days of cartoons back at Warner Bros, Toon Heads: The Lost Cartoons is a just over 45-minute delve into the vaults for a look at some extra special footage. Here you’ll find rare home movies, gag reels, and long unseen sequences from a variety of films including the first Harman-Ising Bosko and Foxy shorts (including the full Lady Play Your Mandolin), the Snafu and Hook wartime series, a public health film, commercials, a really cool television pilot and a live-action comedy short. The program is well presented, offering lengthy clips and showing much more than one would expect to see of such usually “censored” films, and though Leslie Fram’s voice-over is a little overly excited, it covers all bases and even throws in some extra history not covered elsewhere on the set – another great bonus! More rarities along those lines can be found under The World Of Leon Schlesinger banner, presenting around 30 minutes of additional, mostly early-era cartoons with occasional introductions from Beck and ink-and-paint girl Martha Sigall. 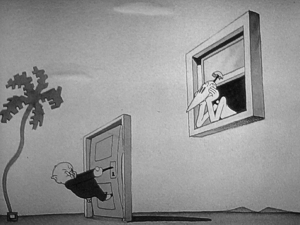 1929’s Bosko, The Talk-Ink Kid and Sinkin’ In The Bathtub from 1930, widely acknowledged as among the very first official Looney Tunes cartoons, are black and white classics ancient by today’s standards but still significantly important. Cryin’ For The Carolines and It’s Got Me Again! 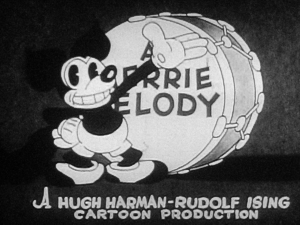 is a Vitaphone short from 1930 and a Harmon-Ising Mickey Mouse-clone cartoon from 1931 respectively, and there’s the animated title sequence from Schlesinger’s live-action picture Haunted Gold, but the best is saved for last. In his now already dated intro, Beck suggests that the Schlesinger Productions Christmas Party reels from 1939 and 1940 haven’t been seen in public for over 50 years, but they have in fact been sampled in various documentaries over the years and, of course, they cropped up on the sixth and final Golden Collection DVD release. However, it’s great to see this 18 minutes’ worth again here, and thankfully the optional commentary from Beck and Sigall, who is able to heartily reel off an impressive roster of names, has been retained. These reels were never intended for outside viewing and as such there’s a smattering of slightly risqué humor that’s typical in stuff like this, but what’s very clear is that the artists’ work environment played a very significant part in the cartoons the unit turned out, with everyone including Schlesinger willing to get in on the fun! Gwreat stuff, gwreat stuff! A little less significant, since we’ve seen them before in Image Entertainment’s excellent DVD as well as across the Golden Collection volumes, is a slightly further stretching of set’s focus to include some of the Studio’s wartime efforts. In the Real American Zero: The Adventures Of Private SNAFU featurette (9:10), Kausler explains how the character (named for Situation Normal All Fouled Up, though the F was usually replaced with something a little stronger!) started out in an Army and Navy movie magazine reel sent out to World War II forces before Hollywood military film unit director Frank Capra (yes, the very same) suggested a series. Walt Disney’s budgets were too high and so Schlesinger won the contract, the SNAFU shorts being passed around all of the director’s units, as well as including contributions by Capra’s writer, Ted “Dr Seuss” Geisel. 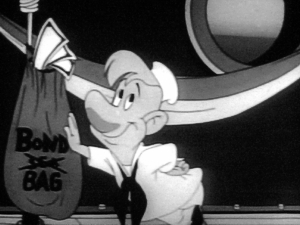 Once again providing back-up to the context-placing featurette, there’s a chance to see a handful of these Private SNAFU cartoons again, as well as three (of only four outings) cartoons featuring Hank Ketchum’s Navy pal Mr Hook. 1943’s Coming!! 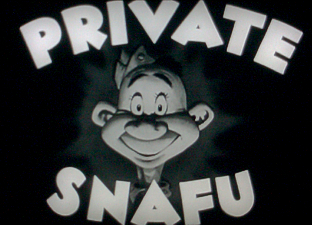 SNAFU (3:00) is the first, designed and directed by Chuck Jones, running half as a preview introduction to SNAFU and half as a regular cartoon. 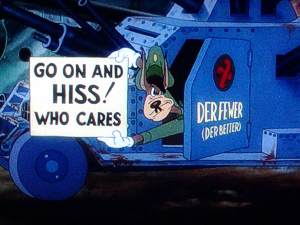 The second short, Gripes (4:09), is the first series cartoon proper, directed by Friz Freleng and with the clear influence of Geisel’s rhyming dialogue. Spies, The Goldbrick, The Home Front, Rumors, the funny Fleischer spoof Snafuperman (complete with Sammy Timburg fanfare) and Censored (1934) make up the rest of this selection, roughly half of the full SNAFU output. Mr Hook was essentially SNAFU’s Naval counterpart, though Hook isn’t as entertaining a character as SNAFU and by the time of his introduction the War was all but over. The three shorts here (The Good Egg, The Return Of Mr Hook and Tokyo Woes) are all 1945 propaganda cartoons and obviously examples of their unsure times. Tokyo Woes, clearly even from the title alone, features the most racial stereotyping, but it is also the most elaborate short of the three, which add up to a total of over eleven minutes playing time (a couple of instances of nasty audio breaks on the previous Golden Collection DVD volumes seem to have been dealt with, so there’s no need to worry about your speakers this time). Actually, the SNAFUs look and sound a little better here too, even if they still can’t match their Image counterparts. It’s important to remember that these cartoons were only intended for services viewing from 16mm prints, so the quality here is pretty good, considering and the digital artefacting that I picked up on the WB DVD edition seems to have been eliminated. Because these films were made by young men and intended for those cooped up or under fire in the armed forces, there’s a broadness to these films that passes way beyond even the gentle risqué humor found in the regular Looney Tunes which, if anything, makes them even funnier. Despite being made in black and white for cost reasons, the values in each short are top notch, and they’re always worth another watch. Okay…so getting the obvious out of the way first, yes, it’s a shame that these additional cartoons are mostly not presented in high-def, but I’d argue that the AVC codec does a much better job of retaining the original imagery without compression artefacts. The focus on Clampett, Schlesinger and, especially, Freleng and Avery is most welcome, with a nice offering of their non-WB work for MGM (ironically Freleng part-way through joining Termite Terrace, Avery’s from after he left the Studio). Blitz Wolf has a healthily high bitrate and looks very good for the most part (after a softer than satisfactory opening sequence taken, presumably for print damage reasons, from an alternate source), as do many of these cartoons. 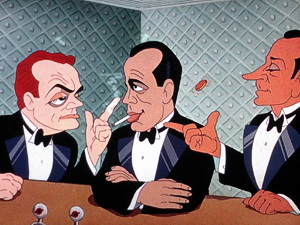 Presented as “bonuses” allows Warners to skip past these quality control issues and make these cartoons, including the best of Tex’s MGM classics, finally available on disc in any form – yes, we would prefer the TBS/BBC documentary to have been accompanying a dedicated Avery set, but it simply doesn’t look like that’s going to happen. What we have here is a stop-gap in those regards, for sure, but it’s a pleasing one for the moment; a package that seeks to bring us something along those lines for now, and more than appropriate in this particular selection. Attempting to make a big splash for itself in the marketplace, the initial Platinum volume of Looney Tunes did just that with an extensively lavish ultimate collectors’ set that, ultimately, looked extremely nice on the shelf but didn’t really offer collectors anything jaw-droppingly awesome. Much better value, and retaining all the genuine goodness to be found in that bigger box, was the regular DigiBook set itself, the three discs housed within one of Warners’ deluxe Blu-ray sized book packages containing a wealth of information from Tunes historian Jerry Beck. There’s a genuine feeling that this particular collection has been put together with a bit more of a cost-conscious approach in mind: there’s still a 28-page collection of notes and imagery from Beck, but this time it’s in the form of a smaller booklet housed in a standard Blu-ray case instead of a deluxe DigiBook. One suspects that a DigiBook offering was the original intent, but that a less elaborate packaging would reduce the production cost and that to the consumer, hopefully translating into healthy sales. I’ve no idea how Volume One sold, but one gets the idea that this could be it for the series unless it flies off store shelves. Otherwise the packaging is very nice and still special: it’s not every Warner set that comes with such a booklet and the additional glossy slipcover, while not the most original in design, at least lends the title some “shelf prestige”. It’s a shame the booklet still doesn’t contain director credits or the release date info that used to adorn the LaserDisc boxes of old, and even a cursory glance reveals that the Special Features listings for some of the supplements are incorrectly assigned to the wrong discs – no great calamity, but a faux-pas all the same. Offered in their original aspect ratios of approximately 1.37:1, the Academy-framed cartoons look fantastic in HD. Colors are strong and vibrant, and the source prints largely in good shape, although understandably a small amount might be described as not being as in good shape. These are mostly from the pre-1948 era that saw the cartoons going through various reissues, television playings and eventual public domain heck, so that they look anywhere near decent is to be applauded. What’s really noticeable is the sharpness of the animators’ lines, offering a new appreciation of their art and going some way to eliminating any complains of minor print artefacts. Remember that the Warners cartoons were essentially budget affairs to begin with: cels would be scrubbed and reused and dust would often find its way underneath the animation camera, so there are built-in imperfections inherent in the source elements to begin with. Whereas Disney’s classic feature transfers digitally clean the image so we see how the artwork would look as if it had been photographed with today’s technology, WB’s approach retains what made these great films to begin with; a different take on similar material but just as appropriate. Thankfully, any issues that might have marred the original DVD versions (such as DVNR or compression) are a no-show here: given their history this is just good – and in places better – as these cartoons should look! Considering the age of these cartoons must have some impact on Warners’ choice of going for a compressed Dolby Digital track instead of picking a lossless format. Yes, in theory a lossless option would be preferable, but then would hearing decades-old mono soundtracks in this way bring anything more to the table? Perhaps, but the difference would be negligible and could maybe impact on the space given over to the visuals. Warners took a long time to come to the DTS party on Blu-ray and, while uncompressed tracks in that format may well be overly exorbitant, the basic 192kbps here just feel a little too compromised. Of course age again does play a big part in how good these shorts can sound, and I’m probably picking something apart that doesn’t warrant it; the films here sound clean and the music largely pounding with resonance that sometimes suggests a wider field than mono as well as some phantom, but no less solid, bass. Some may wish these Platinum Collections followed the path set by the Golden DVDs in what each set offers – permitting them to simply upgrade their favorite volumes – but I actually like this approach much more, allowing for cartoons that came late in that series to make appearances a little earlier as well as some totally new to disc rarities and a new mixing to the choices featured that bring us something like “the same, but different”. This is absolutely the way to go with these releases, shaking things up but bringing back some old favorites and reacquainting us with some of the excellent bonus features previously produced as well as the debut of new pieces and largely never-before-seen vintage picks from the archives. Best of this bunch are the two lengthy looks at Tex Avery’s life and work – with tributes to Chuck Jones done and covered last time, the doors are now opened to shining the light on others from Termite Terrace: the Looney Tunes Platinum Collection Volume Two is every bit as essential as the first volume, and perhaps even more so!